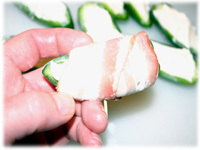 These stuffed Jalapeno Peppers (I call these little darlings Jalapeno Bombers) really are one of the most easy appetizer recipes for the grill that you may ever make. I first experienced these spicy grilled appetizers at a friends home several years ago. It was intriguing to watch this native from Texas grill up something other then beef for a change! 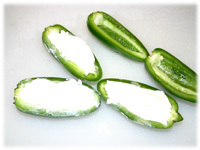 Cut the Jalapeno's in half, scoop them out and fill them with cream cheese (plain or flavored). Wrap them in thin bacon and on the grill they go. Once I got a taste of them (and saw how easy these party appetizers were to make) I couldn't get enough of them. The trick is to use thin bacon so it cooks quickly and to wrap the bacon carefully so you don't lose any cream cheese on the grill. If you can't get thin bacon then partially cook it in the microwave and allow to cool before wrapping the jalapeno with it. These are great little appetizers with a nice slow burn - you may find yourself serving them right off the grill. They make great Superbowl appetizers too! Caution: Jalapeno peppers can be very hot and the oil from the seeds can cause skin and eye irration if you come in contact with it. Wash your hands thorougly after handling these peppers. 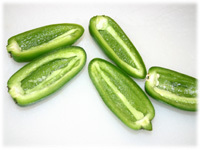 Slice each Jalapeno pepper in 1/2 length-wise. Remove the seeds and membranes from inside the peppers and rinse the scooped-out peppers under cold water. With a small spoon scoop enough cream cheese into each jalapeno to fill it level. 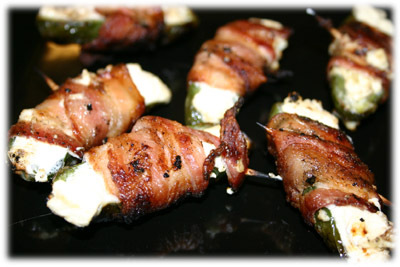 Wrap a 1/2 slice of bacon around each cheese filled jalapeno and secure with a tooth-pick. Try to cover as much of the cream cheese as possible to avoid leakage. 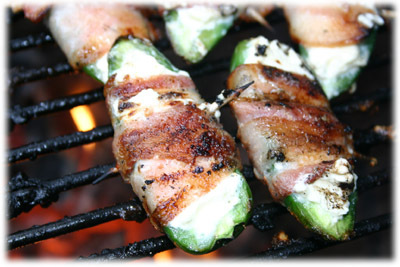 Place each Jalapeno Bomber on the grill and close the lid. 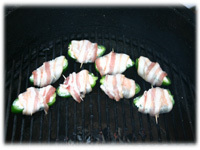 In 6 minutes lift the lid, check the bacon on the grill-side of the jalapeno - if it looks done then flip the bombers. After another 6 minutes lift the BBQ lid and check how the jalapeno's and bacon are doing. If they look done like these just below then remove from the grill and serve immediately. You'll likely have a group of people standing around you by this point so just start handing them out.